The study, published online today in the journal Proceedings of the National Academy of Sciences, illustrates that when human actions alter the characteristics, or "phenotypes," of wild species, these changes can become irreversible. This can have long-term evolutionary consequences because natural phenotypic variation buffers species from environmental changes and is a fundamental prerequisite for future evolution. "If you lose the spring-run gene, you could potentially lose spring-run chinook forever," said lead author Tasha Thompson, a UC Davis doctoral candidate in the lab of UC Davis Professor Michael R. Miller in the Department of Animal Science. "You can't just assume the potential to recover them will persist in fall-run salmon populations." Wild chinook salmon date back millions of years in western North America. While fall-run populations are relatively abundant, spring-run chinook are on the brink of extinction in most locations where they haven't already been lost. Spring-run chinook are highly prized by indigenous cultures on the West Coast, where the fish figure centrally in "first salmon" ceremonies and are treasured for their extra fatty flesh. Other fishermen and seafood-lovers seek out "springers" for their good-eating qualities, as well. And the fish are ecologically important, delivering marine nutrients higher in the watersheds than their fall-run counterparts. Historically, many rivers hosted large numbers of both spring-run and fall-run chinook. But, the study notes, "because they rely on clean, cold water throughout hot summer months, spring-run chinook are more vulnerable than fall-run chinook" to activities such as logging, mining, dams and water diversion, and to climate change. Their first stop with was Oregon's Rogue River, one of the few remaining locations with a significant number of wild spring-run chinook. Before a dam was constructed in 1977, most chinook entered the upper Rogue River in the spring. 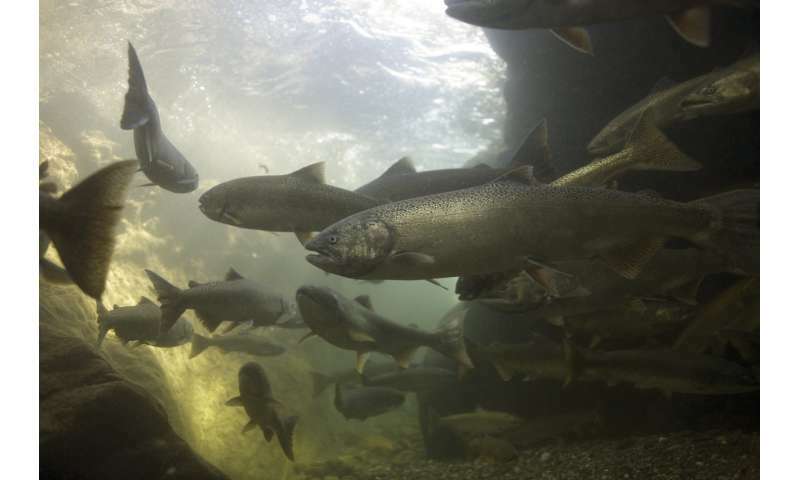 After the dam, spring-run chinook dramatically decreased while fall-run chinook increased. This shift in run timing corresponded with an alarming decrease in the prevalence of spring-run genes. 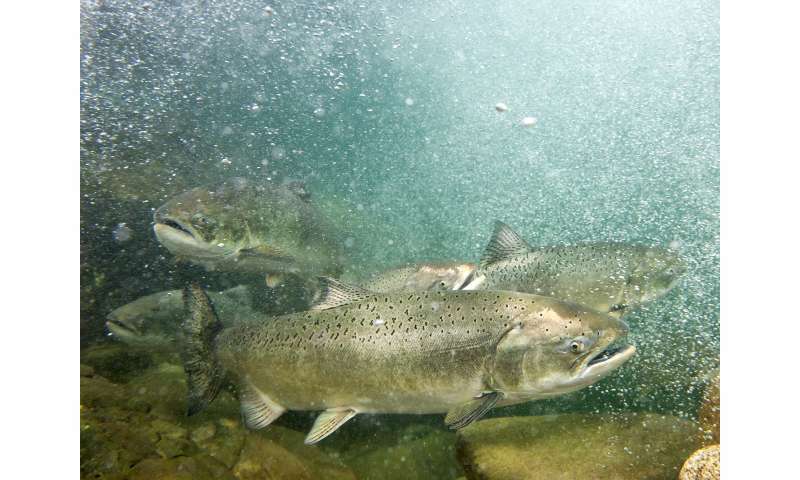 If these trends continue, the authors' research suggests the potential for complete loss of spring-run genes that are essential for producing Rogue River spring-run chinook returns. Their next stop was the upper Klamath River basin, where dams have prevented upstream salmon migrations for over a century, but where archaeological sites retain the history of salmon harvest at indigenous fishing sites across thousands of years. By sifting through DNA extracted from ancient salmon bones, the authors confirmed the historical presence of spring-run genes in upper Klamath chinook prior to the dams. Dam removal could reopen habitat suitable for spring-run chinook restoration. 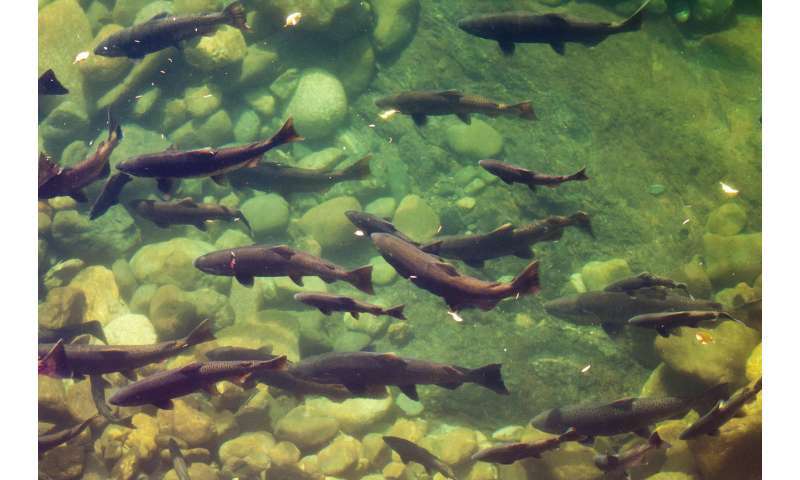 The authors then sampled contemporary fish from tributaries below the Klamath dams to find potential source populations with spring-run genes that could be suitable for recolonization following dam removal. They examined if the more abundant Klamath fall-run chinook could be serving as a reservoir of spring-run genes. In the Shasta and Scott rivers, Klamath River tributaries where spring-run chinook went extinct in the 1930s and 1970s, respectively, the spring-run gene was essentially missing from the fall-run chinook. This result is especially concerning given that wild spring-run chinook are expected to be lost from the Klamath basin within 50 years. "Out of almost one thousand fish, we found less than 1 percent carrying spring-run genes in each river," Thompson said. "Those fall-run chinook populations cannot be considered sustainable reservoirs of spring-run genes." With such low numbers, is it too late for spring-run chinook? Thompson doesn't think so. "I definitely have hope for these fish," Thompson said. "A lot of people care passionately for spring-run chinook. Hopefully our results will be used to focus the conservation effort for them."